I am convinced that a majority of Americans want what those first Americans wanted: A better life for themselves and their children. In 1976, the GOP race to the Whitehouse, although not as crowded, has loose parallels to the electorate and electoral climate of today. The conservatives within the GOP were outraged by certain policies and initiatives that the moderate appointee, Gerald Ford, had undertaken as Commander in Chief. Because of this frustration, a conservative outsider by the name of Ronald Reagan, rose to challenge the establishment and surged in popularity and the polls. The Reagan Revolution was born, changing the party from pale pastels to bold colors. Yet, Reagan did not secure enough delegates and the establishment’s choice, Ford, won the nomination but lost the election to Jimmy Carter. Carter also campaigned as an “outsider,” but as an outsider to the sagas and conflicts plaguing Washington. The results of the Carter administration have striking similarities to our current domestic and foreign policy challenges of today. Unemployment and debt continue their historic rise; Iran has imprisoned 4 American hostages and takes center stage in our debate in foreign policy; and, many voters are once again asking themselves, are they better off than they were four years ago? According to the latest polling data, American voters may be once again looking for a conservative outsider–an outsider who is not of the government, but of the people. In the latest Quinnipac poll, 71% of American voters are dissatisfied with the direction of the country; 53% disapprove of the job Barack Obama is doing; 49% of voters are dissatisfied with Washington and 27% of voters are not only dissatisfied with Washington, they are angry. The “we are mad as hell and not going to take it anymore” crowd is also seen in the latest Monmouth poll–in relation to the 2016 GOP field. Some 66% of Iowa GOP caucus goers say regardless of who they support, the nation needs a president from outside of government who can bring a new approach to Washington. Based on the GOP beltway betrayal after the November 2014 election, it should come as no surprise that The Outsiders of the beltway: Trump, Carson and Fiorina, have surged in popularity. Based on every measure and statistic, American’s are not better off than they were four years ago and the problems created by politicians, have not been solved by other politicians. Like Carter, Hillary and Bernie continue to tell us just how bad things are in this country, and like Carter, they blame America, not the government, for the many problems facing American’s. A majority of Americans believe Hillary is a liar and a majority of Americans are not feeling the Bern of socialism. In direct contrast, the pediatric neurosurgeon, Carson, promises to Heal, Inspire and Revive. Trump closely reiterates Reagan’s campaign promise from 1980 to Make America Great Again– by building a wall and creating jobs. Carly promises New Possibilities and Real Leadership by changing the way government works, and Cruz intends to Reignite the Promise of America with his brand of constitutional conservatism. This messaging strikes at the very core of the Obama malaise and appeals to the American spirit–a spirit found on both sides of the political aisle, who want a better life for themselves and for their children. 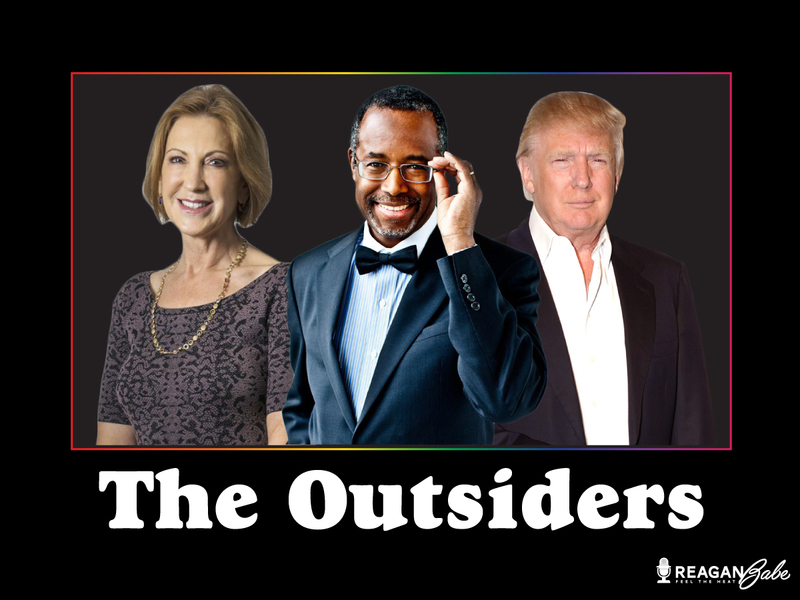 The Outsiders have struck a chord within the GOP electorate and have a message that resonates with many Independents and Democrats. A revolution within the base is sounding the alarm once again, as it did in 1976, 1980, and 2014. When Carter lost to Reagan in 1980, Carter’s chief domestic policy advisor, Stuart Einzenstat, remembers: “We had an underlying conservative electorate to begin with. The events that occurred over the four-year Carter presidency had reinforced that.” Looking at the numbers, we still have a conservative electorate and Trump, Carson and Fiorina are leading the revolution.